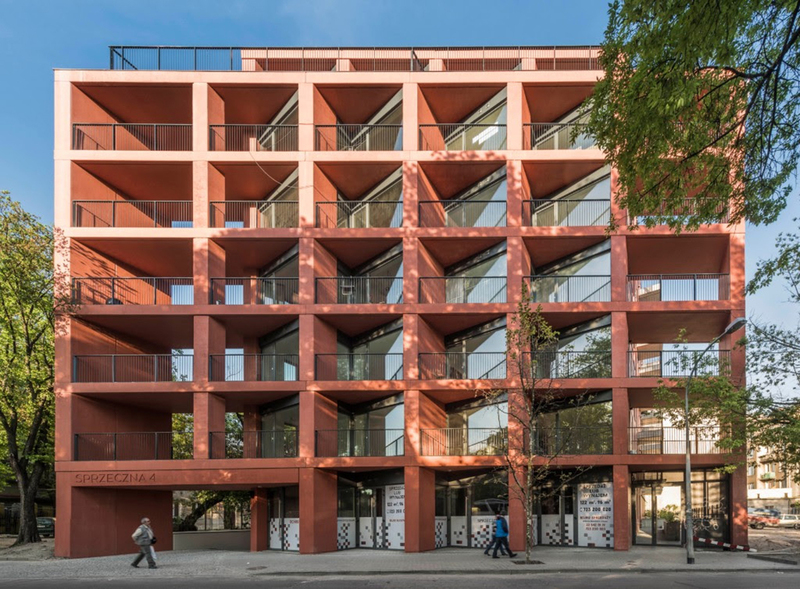 A new exhibition at Architektur Galerie Berlin SATELLIT details the Polish firm BBGK Architekci and their recently completed Sprzeczna 4 apartment building in Warsaw, Poland. Manifesto of Prefabrication, on view through Saturday, September 29, explains why this multifamily complex is an innovative prototype for modular housing in the country. Most housing estates built in Poland during the communist period feature large-panel concrete in prefabricated designs. This typology is ubiquitous throughout the country, especially in the capital city of Warsaw, and it has a poor reputation for being ugly, impersonal, and unsustainable. BBGK constructed Sprzeczna 4 in protest against this conception and to show that prefabrication is a valuable construction method for 21st-century housing. The complex utilizes low-cost technology, prefabricated elements, and heated ceiling systems to achieve a cohesive, contextually appropriate design. Ample light infuses the apartments through large windows framed by exposed colored concrete. Sprzeczna 4 not only flips stereotypes about traditional modular construction in Poland, but it also sheds light on past improper building practices. Historically these buildings were built by poorly paid immigrants through a semi-feudal system, but BBGK implemented fair business practices and social responsibility to create this contemporary twist on conventional Polish housing. According to the curator, Marcin Szczelina, the project is a proposal for a new way of using the prefabrication method not only in Poland, but in Europe and beyond. Manifesto of Prefabrication can be seen this week only at the Architektur Galerie Berlin SATELLIT. It is open Tuesday to Friday from 2 p.m. to 7 p.m., and Saturday from 12 p.m. to 6 p.m.